A Palestinian State: Why Not? Israeli Prime Minister Benjamin Netanyahu recently noted that with the Middle East in chaos, it may not be a good time to establish another rogue state, Palestine, which would likely be taken over by Iran's proxy, Hamas, which would then launch a bloody war against Israel. The Prime Minister's declaration was greeted with alarm among the commentariat, because the belief that establishing a Palestinian state will lead to peace has become an article of faith immune to fact or reason. The Palestinian Authority is utterly dysfunctional. It's a clan-based coalition made up of murderous political mafias. It deprives the Palestinians of even the most elementary rights, robs them of billions in aid from the U.S. and Europe, keeps most of them in penury and misery, oppresses women, gays and lesbians, and all who aren't Muslims. It foments rage against Israel by incessant incitement that calls on even small children to kill Jews everywhere. Is granting it statehood really the path to peace? The belief that establishing a Palestinian state will lead to peace has become an article of faith immune to fact or reason. How can anyone who cherishes human rights, who claims that they care for the oppressed Palestinians, believe that subjecting them to greater oppression is justified just so that they can enjoy a putative political "self-determination," - the kind enjoyed by the citizens of Saudi Arabia, Libya, Syria, Iraq, Yemen, Pakistan, or Iran? Israel sinned against the Palestinians when, in the Oslo Agreements, it agreed that a terrorist organization, Arafat's PLO, should rule them. 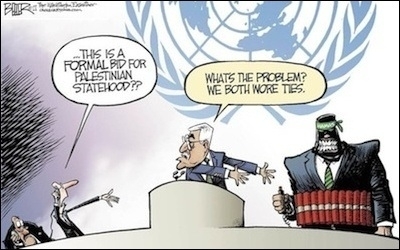 The idea was that the PLO would take on Hamas; instead, Israel got two terrorist organizations competing over which one will destroy Israel first. There is the danger, above all, that any Palestinian state will be taken over in no time by Hamas. As in Gaza, Hamas would promptly launch massive missile attacks, this time against the heart of Israel. Thousands could be killed and wounded, and Israel's civil and military infrastructure would suffer heavy damage. Israel would have no alternative but to conquer the West Bank in bloody battles in heavily populated areas, with thousands of casualties, Arabs and Jews alike. The remaining Arabs would inevitably flee to Jordan, destabilize the monarchy, and possibly even establish a Hamas state dominated by Iran on Israel's eastern flank. The proposal to secure peace by assuring a disarmed Palestine in a non-starter, as well. After all, sovereignty implies self-defense, and the right to raise an army, which Israel and other regional actors cannot accept. As for a moral claim to Palestinian land? There is none. When the Arabs received, in the post-World War I peace conference, 93% of the vast territories of the Ottoman Empire, their representative, the Emir Faisal, the ruler of Arabia, willingly relinquished any claim to the territory that became a British mandate designated to establish a Jewish national home. He welcomed the Jews back to their fatherland. He gave up very little. What about that monstrous occupation that the White House chief of staff said must end? There simply isn't one. Palestine, in the words of Mark Twain, was "a prince of desolation." Only 4% of the land was inhabited, largely by nomads. There was never a national Palestinian entity or nation with any claim to this deserted land. But what about that monstrous occupation that the White House chief of staff said must end? There simply isn't one. The area designated for Palestinian self-rule by the Oslo Accords is ruled by the Palestinian Authority. Israeli troops enter it in hot pursuit after terrorists – and then leave. Any occupation is actually only by PLO terrorists, who were foolishly brought to the West Bank from Tunisia by cynical Israeli politicians, and since have inflicted great harm on the local population. Peace is possible, but not through the establishment of a corrupt dictatorship. In fact, peace did come to the West Bank between the war of 1967 and the first Intifada of 1987, as it did to Europe after its dictatorships were defeated in World War Two. Under those twenty years of Israeli occupation, in the West Bank, the standard of living quintupled, agriculture and small industry were revolutionized, seven institution of higher learning were established, the status of women, children and minorities improved dramatically, and there was no terrorism. Alas, the Oslo Accords put paid to that: they foisted Yasser Arafat and his terrorist PLO on the hapless West Bank inhabitants. The first steps Arafat took was to attack Israelis who ate and shopped in West Bank cities, and to interrupt all economic relations, thus lowering dramatically the standard of living of West Bank Arabs and causing high unemployment, which reached among 30% among young people. Peace could have existed between Arabs and Jews a long time ago if not for the imposition of Arafat's Palestinian Authority on the West Bank Arabs. The upgrading of this criminal "Authority" to a state will delay it by another generation. Daniel Doron is founder-director of The Israel Center for Social & Economic Progress (ICSEP), a public policy think tank, and a fellow at the Middle East Forum.